'Applying the Liturgical Prescriptions of the Code of Canons of the Eastern Churches'. It is available (in English) in the online library of the EWTN, and also (in a less searchable and legible form) on the Vatican website, as is the original Italian. Here are some quotations. If we take these seriously, they have implications for liturgical practice in the West as well as in the East. The priest facing the people is alien to the customs of the East? It is in the West as well, for all the necessary caveats about Roman basilicas (where the celebrant would always have been impossible to see in any case). Lay people distributing the Eucharist are repugnant to the Eastern tradition? They are to the Western tradition as well. Should the Eastern Churches accept developments only if they are 'coherent with the contextual meaning in which it is placed'? Well, so should we in the West. The Eastern Churches should not only preserve but restore their liturgies in fidelity to their traditions? Well, we clearly have an even more urgent need to do that in the West. 18. 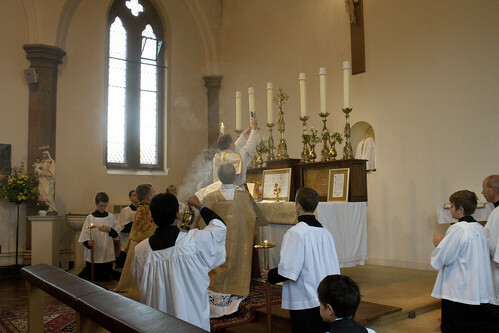 The first requirement of every Eastern liturgical renewal, as is also the case for liturgical reform in the West, is that of rediscovering full fidelity to their own liturgical traditions, benefiting from their riches and eliminating that which has altered their authenticity. Such heedfulness is not subordinate to but precedes so-called updating. Although a delicate task that must be executed with care so as not to disturb souls, it must be coherently and constantly pursued if the Eastern Catholic Churches want to remain faithful to the mandate received. It is once again John Paul II who declares: "If, therefore, you must trim extraneous forms and developments, deriving from various influences that come from liturgical and paraliturgical traditions foreign to your tradition, it is possible that, so doing, you will have to also correct some popular habits." These considerations do not take away from the rightful exigency to express, as much as possible, the Gospel in a plain and clear way for the contemporary man and woman. Every formula necessitates, therefore, unceasing vigilance to remain alive under the breath of the Spirit. But Tradition, even in its literal expression—as is the case for Scriptures—contains unrenouncable treasures; its strengths are received, assimilated, and utilized to transmit to mankind the fullness of the Mystery of God. Indeed, it is about words of fire, just like the Word of God which is sharper than a two-edged sword and penetrates to the division of soul and spirit (cf. Heb. 4:12). The fact that they are constantly repeated in the liturgy should not take anything away from their vigor and perennial timeliness. 20. In modifying ancient liturgical practice, it must be determined if the element to be introduced is coherent with the contextual meaning in which it is placed. Such a context should be understood beginning with eventual references to Sacred Scripture, interpretations of the Holy Fathers, liturgical reforms previously made, and mystagogical catechesis. 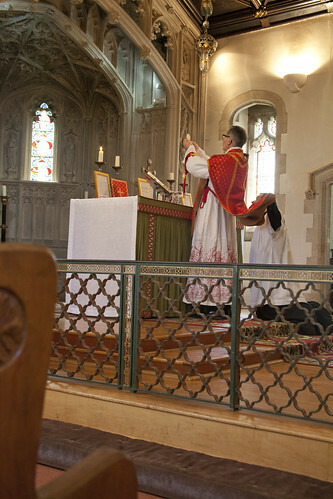 Here it must be verified that the new change is homogeneous with the symbolic language, with the images and the style specific to the liturgy of the particular Church. The new element will have its place if, required for serious pastoral reasons, it blends within the celebration without contrast but with coherence, almost as if it had naturally derived from it. In addition, it should be ensured that it is not already present, perhaps in another form, in a different moment of the celebration or in another part of the liturgical of that Church. Therefore, assigning to the deacon or even to other faithful the task of distributing the Divine Eucharist depends on the instructions of the particular law. It is indispensable to remember, however, that these instructions must be coherent with the specific context of the liturgical tradition in which they are inserted. It should be remembered that all the Eastern traditions emphasize the greatness of the mystery of holy Communion. An ancient Syro-Chaldean commentator describes the presentation of the sacred gifts to the faithful with the following words: "The Holy One comes forth on the plate and in the cup, in glory and majesty, accompanied by the presbyters and deacons, in grand procession. Millions of angels and servants of the fire of the Spirit go before the Body of Our Lord, glorifying him. All the people and all the sons of the Church rejoice when they see the Body come from the altar." Therefore, reserving the distribution of the Eucharist normally to the priests has the scope of manifesting its highest sacredness. Even if this excludes enhancing the value of other criteria, also legitimate, and implies renouncing some convenience, a change of the traditional usage risks incurring a non-organic intrusion with respect to the spiritual framework to which it refers. Therefore, it is appropriate that the faculty of distributing the Eucharist by those other than the Bishop or the presbyter, or the deacon if so disposed by the particular law of each Church , be exercised only in the case of true emergency. Rigorous observation of the eucharistic fast was a unanimous tradition, even if diversified in its forms, in all the Eastern and Western Churches up until the first reforms undertaken in this area by Pope Pius XII. It expressed and continues to signify the concern for a proper spiritual preparation for receiving the Eucharist, life-giving Bread come down from heaven. In the desire to facilitate access to the Eucharist, such practice has been greatly reduced in the Latin Church. A similar example was followed by many Eastern Catholic Churches, while those non-Catholic maintained their customs, even if perhaps less strictly. The change in the discipline of the eucharistic fast has contributed to the development of a greater participation in the Eucharist, although it has sometimes contributed to weakening the awareness of the extraordinary value and meaning of the mystery celebrated. Can. 707 § 1 of the Code of Canons of the Eastern Churches refers legislation in this regard to the particular law. An eventual restoration, at least partial, of the ancient norms for fasting in the Eastern Catholic Churches is valued opportune, taking into account the meaning of both the traditional practice, which does not always exactly coincide with the Latin sensibility, and of the need to correspond with the different conditions of life in the world today. The penitential orientation which accompanies all Christian life constantly appears in every manifestation of worship; in fact, it demands truth (cf. Ps. 50:6) and thus, implies unceasing acknowledgment of one's sins and of the need to change ways. 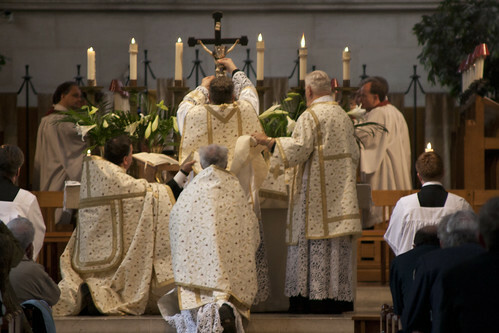 Such an attitude is found throughout the liturgical year and in every hour of the day, but in a particularly exigent way during the times of preparations for the feasts, above all in the one preceding Easter. For this reason, all the liturgies of the East as in the West ever since time immemorial call for Psalm 50 to be prayed even several times a day, the psalm with which forgiveness and the gift of the Holy Spirit is invoked. The penitential attitude notably appears in many sacraments. Baptism, in fact, is given to us for the "blessed purification" of sins, in the Divine Liturgy we offer "spiritual worship for our own sins and the faults of your people," approaching the Holy Communion in which we receive "the Body and the Blood of the Lord broken and shed for the remission of sins;" the Anointing of the sick also procures the remission of sins (cf. Jas. 5:15). In various Eastern Churches, there are moments of liturgical prayer to which penitential value is particularly attributed as is also, in a certain way, a power of reconciliation. Penance in the ancient tradition did not obtain its fruit of salvation only in the liturgical setting, because there are other actions (fasts, alms, pilgrimages, etc.) which already obtain from God a certain grace of forgiveness and there are places (monasteries, sketes, cells, deserts, etc.) in which the ineffable gift of , or mourning for one's own sins, reveals through tears the possibility to be reborn every day in the newness of life in the Spirit. Ever since ancient times, it has been customary in the prayer of the Eastern Churches to prostrate oneself to the ground, turning toward the east; the buildings themselves were constructed such that the altar would face the east. Saint John of Damascus explains the meaning of this tradition: "It is not for simplicity nor by chance that we pray turned toward the regions of the east (...). Since God is intelligible light (1 Jn. 1:5), and in the Scripture, Christ is called the Sun of justice (Mal. 3:20) and the East (Zech. 3:8 of the LXX), it is necessary to dedicate the east to him in order to render him worship. The Scripture says: 'Then the Lord God planted a garden in Eden, in the east, and he placed there the man whom he had formed' (Gen. 2:8). (...) In search of the ancient homeland and tending toward it, we worship God. Even the tent of Moses had its curtain veil and propitiatory facing the east. And the tribe of Judah, in as much as it was the most notable, encamped on the east side (cf. Nm. 2:3). In the temple of Solomon, the Lord's gate was facing the east (cf. Ez. 44:1). Finally, the Lord placed on the cross looked toward the west, and so we prostrate ourselves in his direction, facing him. When he ascended to heaven, he was raised toward the east, and thus his disciples adored him, and thus he will return, in the same way as they saw him go to heaven (cf. Acts 1:11), as the Lord himself said: 'For just as lightning comes from the east and is seen as far as the west, so will the coming of the Son of Man be' (Mt. 24:27). Waiting for him, we prostrate ourselves toward the east. It is an unwritten tradition, deriving from the Apostles." Such practice, threatened in numerous Eastern Catholic Churches by a new and recent Latin influence, is thus of profound value and should be safeguarded as truly coherent with the Eastern liturgical spirituality. 109. It cannot be denied that the Eastern Catholic Churches have been exposed, in rather recent times, to the influence of sacred art styles completely foreign to their heritage, concerning both the external form of sacred buildings and the arrangement of the interior space and sacred images. Yet, from the preceding observations emerges a harmonious unity of words, gestures, space, and objects proper and specific to each of the Eastern liturgies. Continuous reference must be made to this aspect when planning new places of worship. To do so naturally requires on the part of the clergy an in-depth knowledge of their own tradition and a constant, well established, and systematic formation of the faithful so that they may be able to fully perceive the richness of the signs entrusted to them. Fidelity does not imply anachronistic fixation, as the evolution of sacred art—even in the East—demonstrates, but rather, development that is fully coherent with the profound and immutable meaning of how it is celebrated in the liturgy. ...with as much reverence as possible. 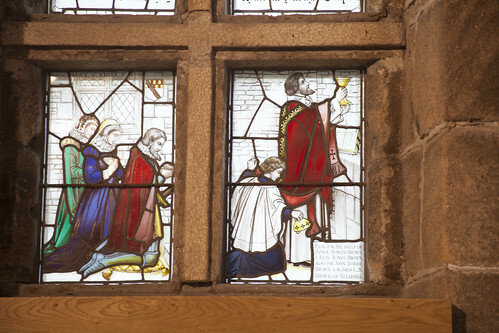 Photographs: Low Mass at Prinknash Abbey (set here); stained glass in window at Padley Chapel dating from the early 1930s, showing one of the 16th century Padley Martyrs celebrating Mass (set here); Solemn Mass with the Fraternity of St Peter in St William of York, Reading (set here); and Pontifical Mass with Bishop Rifan in St George's Cathedral, Southwark, for the LMS AGM (set here). This is excellent. The Novous Ordo inspired neo-latinizations are perhaps the most liturgically harmful act to the Eastern Churches. See my blog for more information on the Eastern Churches within the Syriac Tradition.